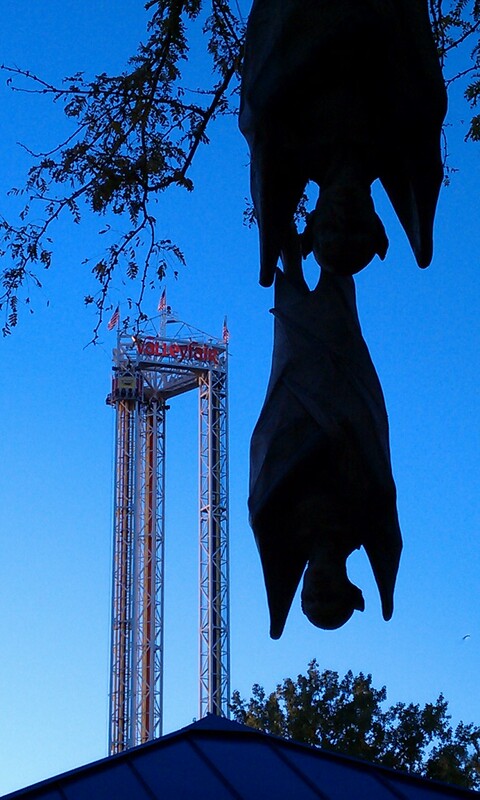 It’s that time of the year when the Valleyfair amusement park becomes ValleyScare! 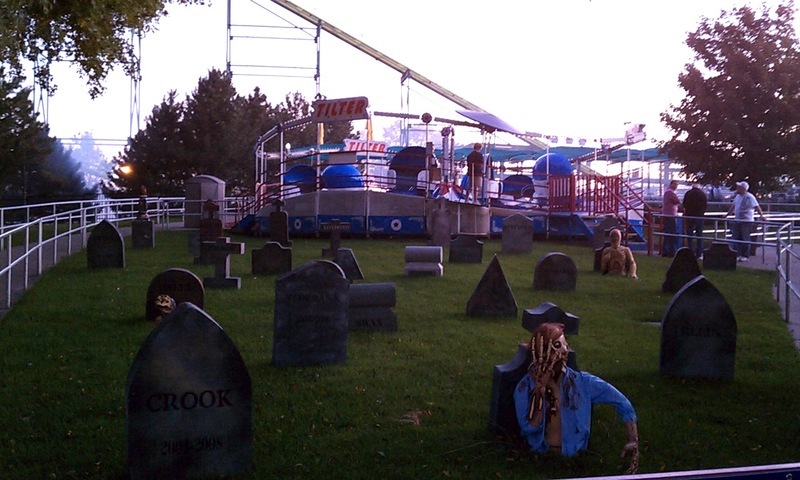 Many of the parks smaller buildings are transformed into haunted houses for ValleyScare. Their gaudy, brightly-lit displays are switched out for black paint, fake blood, windows covered with black curtains, cottony spider-web gauze. Spiders, skulls, bats, rats, gargoyles, vampires, devils, pumpkins, ghosts, witches and devilish half-man/half-monster creatures are planted all over the rides and food vending buildings. The “worst” part of ValleyScare is the hordes of teen actors who are hired to dress up as zombies and monsters to frighten the guests. They’ll sneek out from behind signs and start dragging metal buckets on the ground behind you, or they’ll lumber over from across the road to block your way. Or they’ll just walk quietly behind you until you turn around and then moan or yell in your face. The zombie below had no pretense or guile (that’s zombies for ya) – he just ran full out and screamed at the dude in the hoodie. Hey, it seemed to work! Look at the ants on the roof of the taffy shop – ugh! This turned out to be one of my favorite photos from last night. 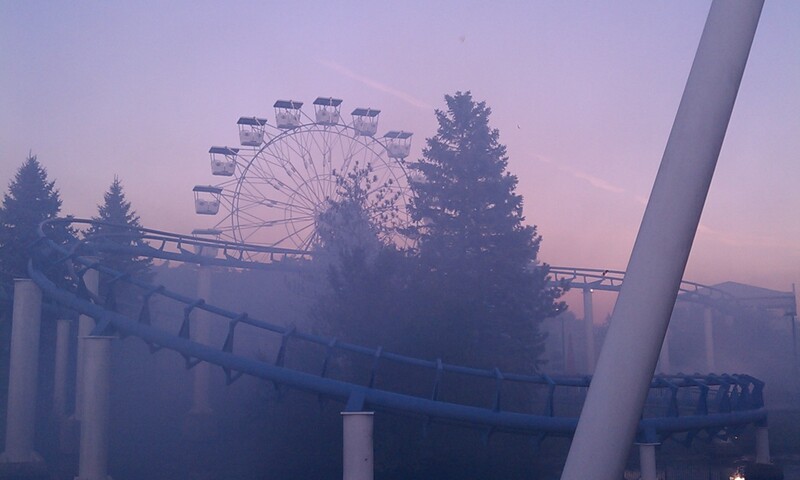 ValleyScare has fog machines located all over the park, and this photo captures the dusk lighting through the mist of the fog. It’s very creepy and empty. Because it was Sunday, and because I arrived before the sun had set, the park was empty except for a handful of other patrons and an entire staff of zombie actors. 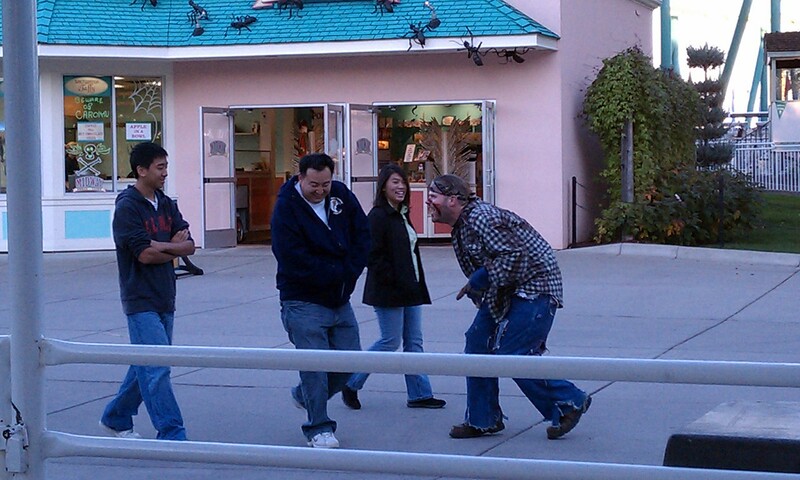 At many times I was one guest to four or six zombies, which really made the park feel like the end of Zombieland. Tombestones in front of the tilt-o-whirl. My favorite ride is the Renegade – it feels like the fastest roller coaster in the park! Unfortunately, it’s allllll the way in the back of the park, which means I had to run the entire zombie guantlet. I don’t mind the whole jump-out-and-scare-you thing, and it’s actually fun when I’m with a group of friends, but when I was by myself they’d jump out, I’d shriek, and then there would be this awkward pause where we’d both think, “Okay….we’re two adults standing here, one of us in a silly custume….now what?”, and I would scuttle away to be received by the next monster. On the way back from the Renegade (yup, it was still awesome!) I cheated and followed close behind a group of three workers in ValleyScare ride operator uniforms so that I wouldn’t be attacked. Zombie camoflage WIN! I love the spiders on the shop!